Wedding Photographers for Brooklyn Winery events are able to capture images that show the rustic charm and vintage elegance that make the winery a prime New York wedding location. As one of the best Wedding Photographers for Brooklyn Winery, I took this image of the bride and groom with the city of Brooklyn bustling behind them. 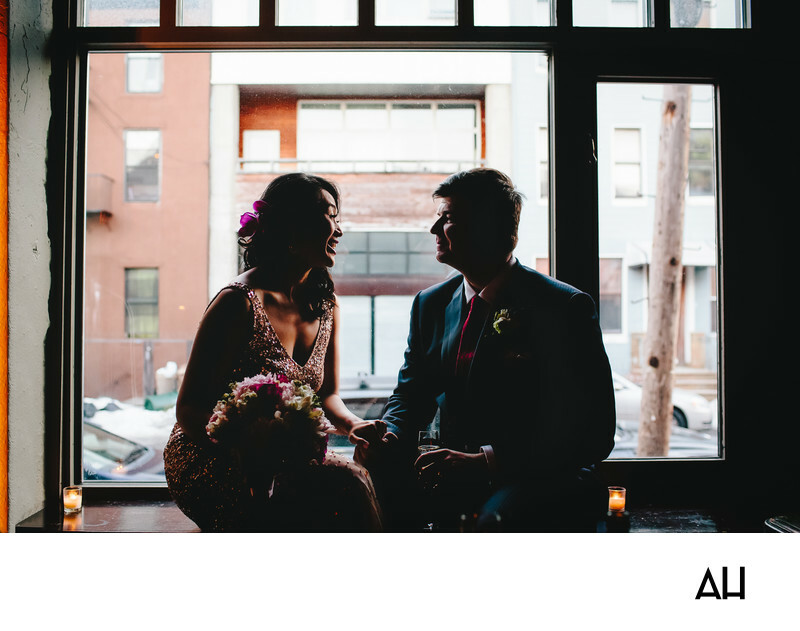 The couple sit on a window sill inside of the winery, eyes locked on each other as they chat about their day so far. On either side of the bride and groom is a tiny tea light. The little candles glow in the dim lighting of the room, while the natural light from the afternoon sun shines in and illuminates the couple, making their figures almost appear as silhouettes. The groom gazes at his bride as she relates the details of her morning to him. He seems content to simply watch her lips move as she speaks, soaking up the moment and enjoying being in the presence of the woman he loves on this special day. The expression on the groom’s face is one of complete adoration and devotion. This is a man who has wanted nothing more than to spend a lifetime with the woman before him, his best friend. The bride smiles back at her husband as she continues to talk. The moment shows how comfortable she is with her groom. Her face is animated as she speaks, and she grasps the hand of her beloved. The bride is radiant, in a non-traditional wedding dress that shimmers even in the darkened room. The dress is the color of champagne and is covered in sequins. It is a unique and beautiful dress for a truly unique, beautiful wedding day.